New England Revolution Third baju bolasepak 2000. This Black and Gray jersey seems to be something of a mythical creature. Upon learning of this jersey, I began a multi-year search to discover more about it, with little luck beyond internet chatter. In that time I was only able to find two photographs. Both possibly of the same jersey, this one, which now resides in my closet. If any others still exist, I am unaware of their locations. All numbers, name, and patches are correct and are stitched on as was the practice at the time. Torres was a Colombian-American Midfielder who as a youth was named by USA Today to their high school soccer All-American list 3 times. Sadly, he found greater success playing in the MISL (indoor) league than for the 3 MLS teams he played for. He currently (2019) is the Head Coach at his collegiate alma mater. 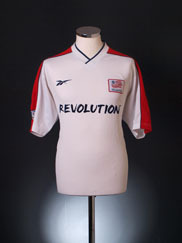 1998-99 New England Revolution Home Shirt Reebok Original Vintage shirt from Classic Football Shirts Ltd.